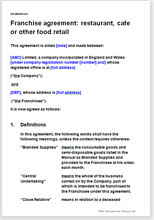 This is a franchise agreement for a restaurant, cafe or other food retail business.It is comprehensive enough to be used by the largest multinational restaurant franchises.Smaller businesses will also find it an ideal template from which to craft an agreement that not only protects the rights of the franchisor, but also impresses prospective franchisees. Both the franchisor and the franchisee can be based in the Republic of South Africa or any other country. This is a franchise agreement for a restaurant, cafe or other food retail business. It covers an enormous number of issues.It is comprehensive enough to be used by the largest multinational restaurant franchises. For smaller businesses, it should be an ideal basis from which to craft an agreement that not only protects the rights of the franchisor, but also impresses prospective franchisees. The advice from the largest association of franchisors in the Republic of South Africa, the Franchise Association South Africa (the FASA), is that you shouldn’t use an advisor who isn’t a paid subscriber to their association. That advice extends to franchise agreements bought from online retailers. This isn’t impartial advice. The trade association is comprised of experienced and knowledgeable people, but it is a private company, commercially operated to promote and to protect the financial interests of its subscribers. When it comes to selecting a franchise agreement from an online retailer, we suggest that you buy several templates from different suppliers in order to evaluate which one is most comprehensive and suits you best. A short agreement,regardless of where it is bought, is unlikely to protect your business sufficiently,not because the law relating to franchising is overwhelmingly complex, but rather because the practical considerations of how the franchise will work require more than a few pages to record them. Net Lawman, along with all our reputable competitors,will refund you the purchase price if you are not satisfied allowing you to evaluate agreements from different sources. From 31 March 2011, the Consumer Protection Act 2008 (CPA) and its regulations substantially changed the manner in which South African law regulates franchise arrangements. The legislation devotes several pages to the rights and duties of franchisors and franchisees, the prescribed content for franchise agreements, and the inclusion of international best practice standards which require proper disclosure to franchisees. This franchise agreement has been drawn for businesses in the restaurant and food retail industry. Whether the food is hot or cold, and whether it is consumed on-site or taken-away does not matter to this agreement. The agreement is comprehensive enough to be used by a business of any size, but we assume that the business will be small or medium sized, perhaps with several established locations already. The franchisor may be new to franchising, or may be looking to extend into the Republic of South Africa. The franchise territory can be of any size, from part of a town to a continent. Generally, it is more advantageous to the franchisor to keep the area small and grant licenses to operate in additional areas to the same franchisee later. The agreement does not cover ownership and lease of property (premises) by the franchisor. The agreement assumes that the franchisee will own or let the premises outside of this agreement either from the franchisor or someone else. We have given the buyer of this document a large degree of control over what the franchisor will give and what the franchisee will do in return. This is an incredibly comprehensive agreement, but we appreciate that it is hard to compare it to those of our competitors without having it in your hands. We therefore would encourage you to buy it, in the knowledge that if it is not what you need, we will happily give an immediate and full refund to you. We also extend our guarantee period from our standard 30 days to 90 with this document. This is one of the longest Net Lawman documents with 35 pages (excluding guidance). Other paragraphs to protect your interests.